Ever since I did my research on Jacqueline Novogratz four years ago for my book, Pioneers of the Possible, I knew I had come across a brilliant, world-changing woman. 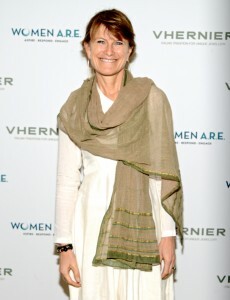 Jacqueline Novogratz is the Founder and CEO of Acumen, a non-profit global venture capital fund that uses entrepreneurial approaches to fight global poverty. In 2011, Jacqueline and Acumen graced the cover of Forbes Magazine for her work in venture capitalism and social enterprise. In her book, The Blue Sweater, Jacqueline shares her personal life story and how she found her life to be intertwined with the life of a child wearing her old blue sweater far away in the wilderness of Africa, and what this connection means for all of us. Her life story is so compelling that when she wrote her book it quickly became a bestseller. Without exaggeration, it took me 2 years to have Jacqueline to come and speak to a group of women here in Los Angeles. But, this comes to show that persistence pays off! Last year, my partner, Beth and I, asked her to come and speak at the WOMEN A.R.E. Summit. However, that first week of November she had to be Africa and India! Oftentimes I have thought about how many times she criss-crosses the globe in a given year. Luckily, her travels this year brought her to Los Angeles on March 13th, where she addressed 170 WOMEN A.R.E. guests. She shared with us her personal journey and amazing life’s work—from training future leaders in developing countries, to funding start-ups that serve the needs of the most marginalized people in the world. It is with a great deal of pride that I say that her vision has touched and affected over 40 million lives to date. She also made another powerful statement that had a deep impact on many of the women, “I want to be used up by life.” Her message highlighted humanity’s interconnectedness – that we are all intertwined not only socially, but economically and in many other ways. She talked about the importance of human dignity, and how much more important it is that wealth. Her core message was focused on how we can unleash the potential of the most marginalized people in the world and lead a life that is full of dignity. May each one of us glean from the wealth of wisdom Jacqueline shared and make the world a better place because of it. Posted in Personal Stories, Pioneers of the Possible, Women A.R.E. | Tagged activism, Acumen, Africa, Angella Nazarian, Forbes, humanity, interconnectedness, Jacqueline Novogratz, love, Martin Luther King, power, quote, social entrepreneurship, The Blue Sweater, venture capitalism, Women, Women A.R.E.